Forty years ago Michel Dufour dragged boatbuilding into the industrial age by being one of the first to design boats specifically for production building methods. The company came out of some recent financial troubles and launched a “new era” in 2003. Since then two parallel but carefully matched lines of cruising boats have been introduced. One is a group of performance cruisers capable of holding their own on the racecourse; the other consists of spacious boats aimed at family sailing and offshore cruising. The flagship of the cruising group is the new Dufour 455, and the 36-foot 365 is due to be launched this fall. We had a brief sail aboard the prototype 455 at its launch in Majorca, Spain. Italian naval architect Umberto Felci has drawn a hull with full ends, a deep body, and exceptionally shallow bow sections. The first 2 or 3 feet of the bow are carried clear of the water when the boat is at rest, not immersing until the boat is heeled and making over 4 knots. As a result, it pounded a bit in light air and chop. We began with a beat into a gentle breeze of around 8 knots. The helmsman has a commanding position behind the twin wheels with the genoa-sheet winches in easy reach—ideal for shorthanded sailing. There is plenty of space for a crew of six in the forward half of the large cockpit. The mainsheet is led to winches on the coachroof, so, in the absence of an autopilot, two people are needed to manage the boat at sea. Hard on the wind in 12 knots of breeze, the 455 made 4.5 knots, but it came alive as the wind built. By the time it had risen to 14 knots (up to 20 knots apparent), we were storming along in fine style making nearly 7 knots with gentle pressure in the wheel. The boat responded accurately to the helm, although the linkage between the two wheels reduced feedback from the rudder. Keeping it at an optimum angle to the wind was easy, and the helmsman had a good view of the genoa luff from both wheels. It stood up to its sail area and showed no signs of needing a reef in 20 knots apparent. Off the wind it was powerful and well balanced, making up to 8 knots on a close reach. 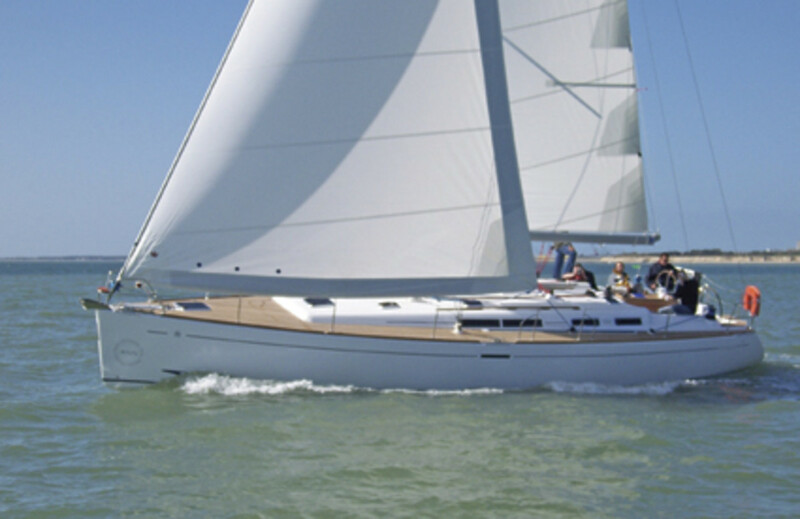 In cruising terms the 455 is fast and stable on all points of sail in mid-range wind speeds. It has good manners and is easily handled by a small crew, though there is a temptation to use the genoa winches while facing away from the sail because they are so far aft. It was interesting to note that, as soon as the boat got going properly, the pounding disappeared and it tended to steer a much straighter course. Belowdecks, there is a choice of one or two aft cabins. In both cases generous headroom and plenty of open space create a pleasant living environment, particularly when in harbor. Stowage is generally adequate, and the longitudinal galley works well. The owner’s suite is forward and should prove very comfortable. The joinery is veneered with maobi, a light, mahogany-like wood, which gives a warm but not oppressive atmosphere. The furniture is neatly put together, and the standard of finish is generally high. Dufour has used resin-infusion techniques for building the deck, which, together with an inner reinforcing molding fully laminated to the hull, creates a strong, stiff, yet light structure. We were impressed by this boat as a sound all-rounder with good cruising performance, particularly in a decent breeze, and a comfortable, well-designed interior.